Where applicable, our fees are inclusive of floor plans, property brochures and schedules of condition/inventories which are all provided in-house. No further fees will apply during a tenancy period either for tenancy renewals and tenancy agreement amendments or for property check-outs. * A comprehensive inventory of the property is included as part of the full management service. If your property is located near to our office in Beaminster we offer a discount on our full management fee. Discounts also apply if you have more than one property regardless of location. Please contact us for further details. Early tenancy termination: if a tenant terminates their tenancy before the end of the agreed fixed term they may, at the landlord's discretion, be liable to pay the term's remaining rent until a new tenant is found. The tenant may also be liable to pay the landlord's set-up fee for a new tenancy arranged within this fixed term period. We provide, at no extra charge, a full inventory of the condition, fixtures and fittings of any property under our full management service. Our landlords are under no obligation to use our particular inventory service. However, we strongly recommend having one in place before a tenancy as they are one of the best ways to protect your property investment in the event that damage beyond fair wear-and-tear is incurred or if there is a dispute between landlord and tenant to resolve. 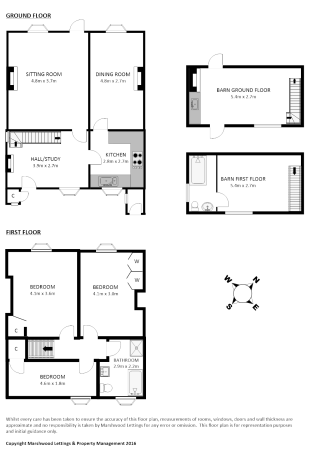 Quality floor plans and brochures are a great way to showcase or visualise any property which is why we provide them at no extra cost.